I have another way to incorporate Nutella into your diet. 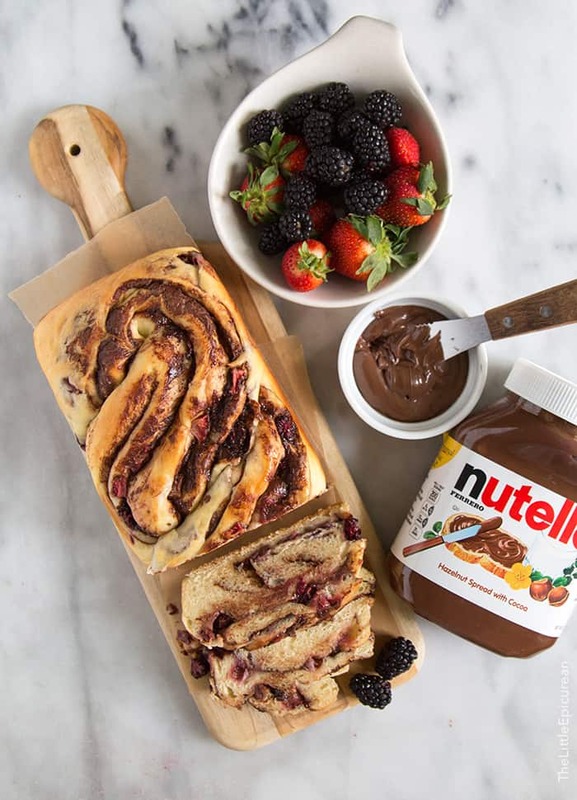 Berry Nutella swirl bread! 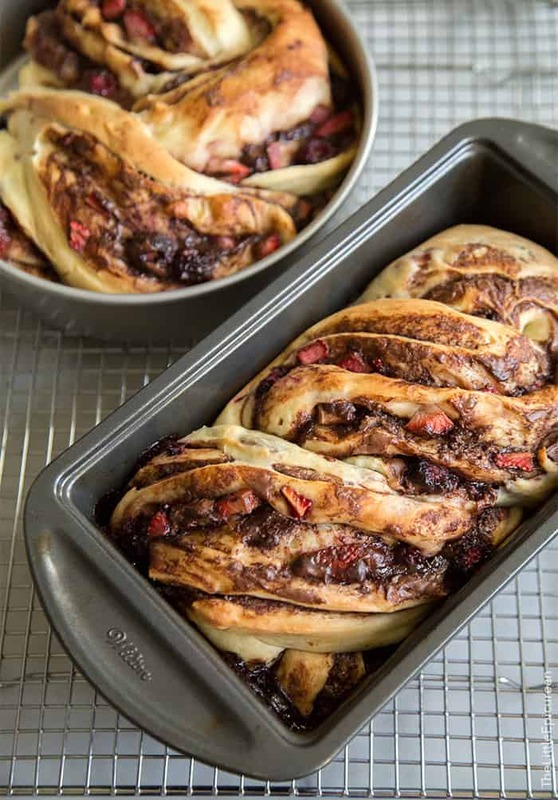 I simply took my favorite cinnamon roll dough and substituted fresh berries and Nutella in place of the cinnamon-sugar filling. Roll it up into a log and divide it into two equal parts. Then you have the choice of baking it into a rectangle bread loaf (in a traditional 9″x5″ bread pan) or a round bread (in a 8″ cake pan). You can also slice the log into 12 parts and create berry Nutella swirl rolls. Once the bread has cooled, it’s time to slice! Because one can never have too much Nutella, go ahead and spread some on the sliced bread and eat enjoy! 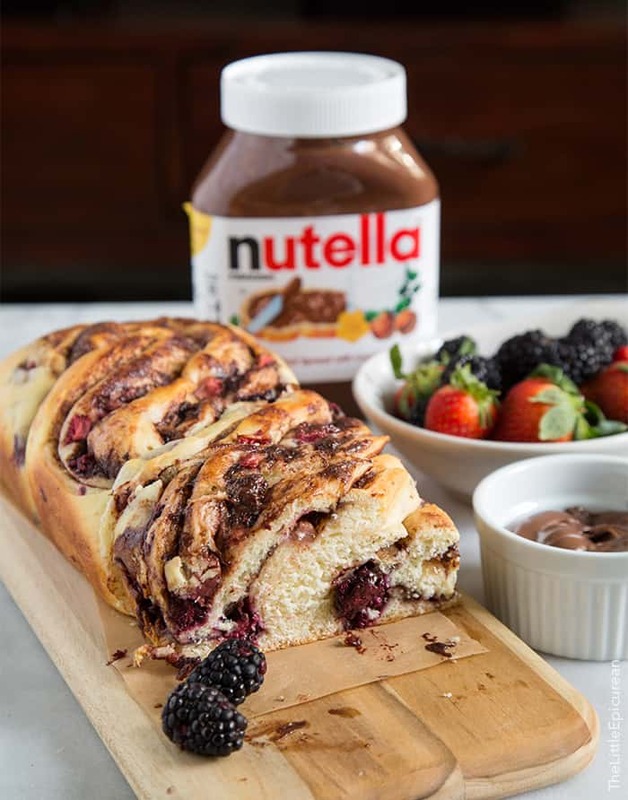 This Berry Nutella Swirl Bread is sure to please Nutella fans. The chocolate hazelnut spread works wonderfully with fresh berries to create a beautiful and tasty bread loaf! 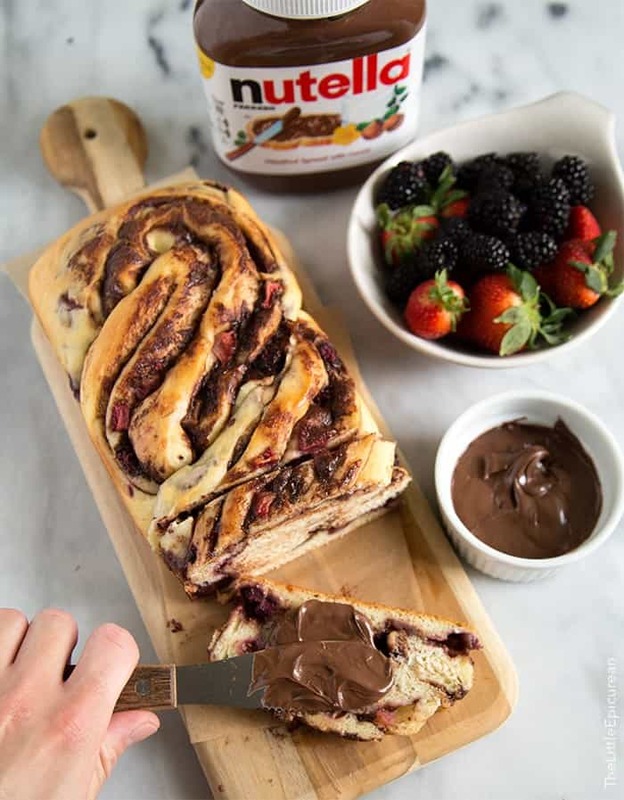 You can also use this recipe to create berry Nutella swirl rolls (like cinnamon rolls). Sprinkle yeast over warm water. Add 1/4 tsp sugar and stir to combine. Let sit for 5 minutes to allow mixture to bubble and activate. Transfer dough to a lightly greased bowl. Cover bowl with plastic wrap and let sit at room temperature for 60-90 minutes until dough has doubled. Punch down dough. Divide dough into two equal portions. Transfer to a lightly floured work surface. Roll dough into a 16x12 inch rectangle. Spread Nutella evenly over the dough, leaving a 1/4-inch border around all the sides. Spread berries over Nutella. 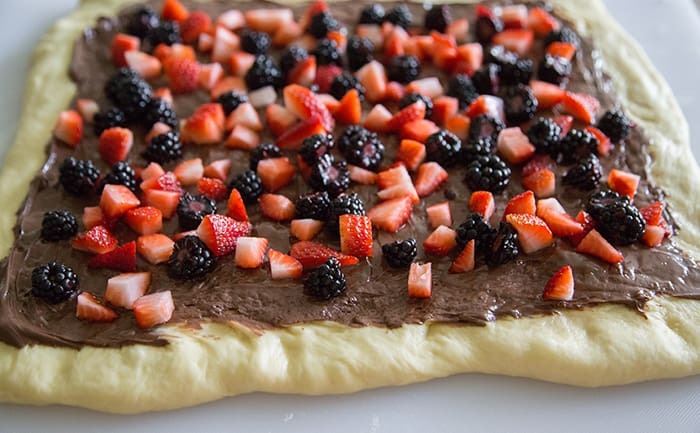 Gently press berries into dough. Roll dough into a tight log, starting with the long side. Slice the log into two equal parts. Stretch each log to a length of about 8-inches. Cut one log lengthwise down the middle. Twist the two halves of the dough over each other, making sure the cut side is facing up. Tuck the ends of the dough into itself. Repeat it remaining log. Place twisted dough into a greased 9"x5" loaf pan. Alternatively, you can also use a 8 or 9-inch cake pan. Simply connect the ends of the twisted dough to create a round shape. Cover with plastic wrap and let bread rise for 45 minutes to 1 hour until the bread has reached the top of the pan. Meanwhile preheat oven to 350 degrees F. Remove plastic wrap and bake for 35-40 minutes until the internal temperature of the bread hit 185 degrees F.
Let bread sit in pan for 5 minutes before running a knife or offset spatula around the edges to loosen from pan. Let cool for 20-30 minutes before slicing. Serve with additional Nutella and fresh berries. This bread is just so fantastically gorgeous. The use of nutella is so creative! I am a Nutella addict! This bread is phenomenal, Maryanne! I want to eat the whole loaf for breakfast! Yum! I am all about the Nutella, but I have never tried it with berries. Sounds amazing!! I used to only eat Nutella with banana, but after trying it with berries- I’m hooked! 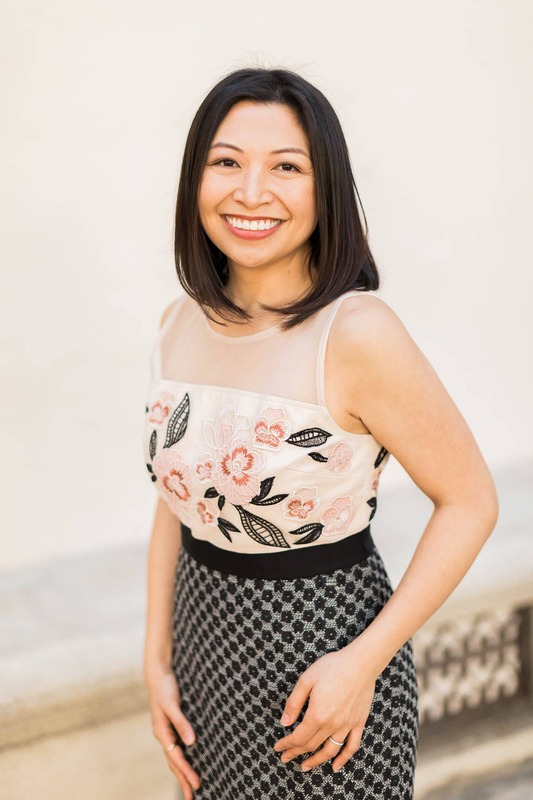 My hubby grew up in the Middle East so I am all to familiar with the Nutella addiction (it’s also funny to hear his first experience with peanut butter. .. The nutty spread I grew up on). Anyhow, this bread looks gorgeous. Did your husband like peanut butter the first time he tried it? For a while, I ate Nutella and peanut butter sandwiches all the time! They taste really good together! You and my dad could definitely bond of your common love of Costco-sized TUBS of nutella;) I’m going to have to make this one for him for Father’s Day this year! Sorry for all the questions: do you think you could bake these into the muffin tins like the chocolate and walnut rolls? And potentially replace the berries with walnuts…haha or are the berries pretty important because as you said, nutella dries out…might just drizzle some on top of the scroll otherwise…win win in any case given chocolate/nutella in involved. This bread looks amazing! How do you and Alex stay so slim with all the yummy food you make!